If you are looking for a truck that can carry heavy loads with less fuel consumption, 2018 GMC 1500 Sierra Denali is an ideal choice for you. With comfortable interior, powerful engine, 20 inches wheels and aerodynamics features, this truck is capable for both on and off road adventures. While abandoning certain colors, some new ones were introduced (Crimson Red Tintcoat, Cardinal Red and White Frost Tricoat). 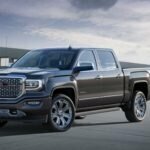 Exterior of 2018 GCM 1500 Sierra Denali was significally redesigned. The recognizable square-jawed front side remained as a trade mark of Sierra Denali. Yet, all features were changed. Therefore we can see a front chromed grille which was enlarged with wider air intakes for improved ventilation which enhances the work of the V8 engine. Bi-halogen projector headlights were redesigned as well and they are equipped with LED lamps. Fog light got new look, too. On the tail side taillights were redesigned and also with LED lamps. 2018 GMC 1500 Sierra Denali has 20 inches black painted aluminum wheels with decorative fenders. Interior of 2018 GCM 1500 Sierra Denali provides highest level of comfort and luxury. Seats were upholstered with Nuance leather and there are lots of wood and aluminum accents inside of the cabin. Dashboard is covered with premium soft-touch materials, while the steering wheel can be heated-very important feature for a cold weather drive. As of high tech gadgets, there are IntelliLink audio system with 7-inch color touch screen, HD Radio with IO5 and IO6 audio systems, wireless smartphone charging, navigation system, Bluetooth, USB ports and a 300-watt inverter that enables to connect a 120 volt electric appliance. Sierra Denali will have a 4G LTE system with a Wi-Fi hotspot. As of safety features, there are StabiliTrak stability control system (with Trailer Sway Control and Hill Start Assist), Forward Collision Alert and Lane Departure Warning. There will be two engine options available in new 2018 GMC 1500 Sierra Denali. One of the engines will be a 5.3 liter V8. This one is capable to deliver 355 hp and 383 lb-ft of torque. The 5.3 engine is mated to a 6-speed automatic transmission. The other engine will be a 6.2 liter V8. That one has power to develop 420 hp and 460 lb-ft of torque and it is paired to a Hydra-Matic 8-speed automatic transmission. According to EPA figures, the average fuel consumption was estimated to 19.5 mpg combines and it can drop to 10 mpg when loading heavy weight. A combination of excellent fuel economy and towing capacity of up to fantastic 11,000 pounds make this heavy duty truck on the top of its class. Although presented as a 2018 model, new 2018 1500 Sierra Denali was released in the summer of 2015. The price of the base model starts at $50,000 and it goes up to $60,000 for higher trim levels.